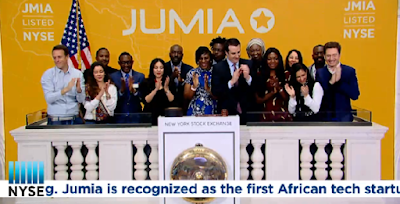 Jumia Technologies AG, the leading pan-African e-commerce platform, has officially announced its listing on the New York Stock Exchange. This listing is the result of team success, and all the Jumia employees across Africa rang the “bell” at the same time in each country and in New York, this listing is the result of team success. Founded in 2012, Jumia started a mission to improve the quality of everyday life in Africa, by leveraging technology to deliver innovative, convenient and affordable online services to consumers. Jumia further empowers businesses to grow, by using its platform to reach and serve consumers across the continent. Jumia is currently active in 14 African countries with more than 81,000 active sellers transacting online with millions of consumers. The e-commerce platform directly employs more than 5,000 team members in Africa. Berenberg Capital Markets, LLC, Attention: Equity Capital Markets, 1251 Avenue of the Americas, 53rd Floor, New York, NY 10020, telephone: (646) 949-9000. A registration statement on Form F-1 relating to these securities has been filed with and was declared effective by the U.S. Securities and Exchange Commission. This press release shall not constitute an offer to sell or the solicitation of an offer to buy nor shall there be any sale of these securities in any state or jurisdiction in which such offer, solicitation or sale would be unlawful prior to registration or qualification under the securities laws of any such state or jurisdiction.